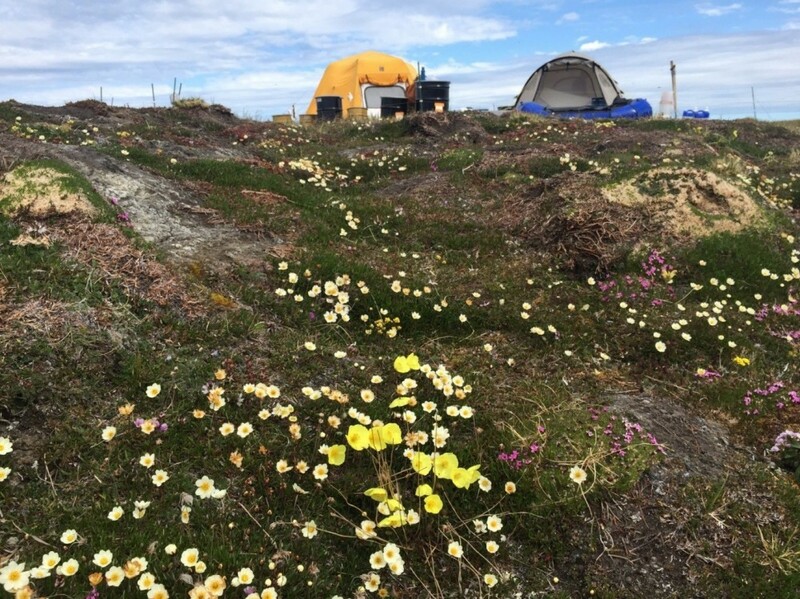 On Coats Island, a stretch of warm weather at the end of June means one thing: Mosquitoes! Sightings of the little bloodsuckers have increased sharply over the past few days and we anticipate the hatching explosion any day now. At their peak, the mosquitoes are so numerous that they can clog the intake on the generator and even jam up the spark plug on the ATV. The evening sun drops behind a small stone hut, probably built by the Sadlermuit people, the original human inhabitants of Coats Island. After the cold and windy start to the season, the weather improved dramatically and it is even warm enough to work in short sleeves during the middle of the day sometimes. 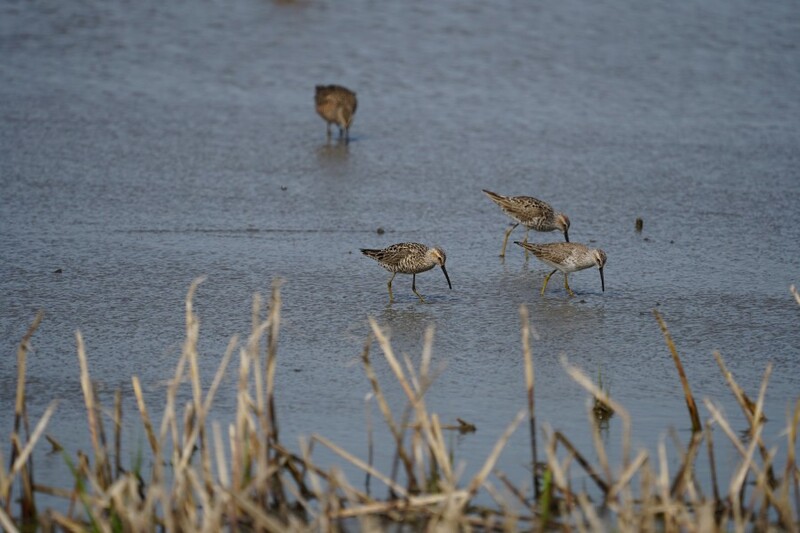 Shorebird nesting has picked up rapidly in response to the better weather and we have now found over 100 nests and will probably match last year’s total by the end of the season. 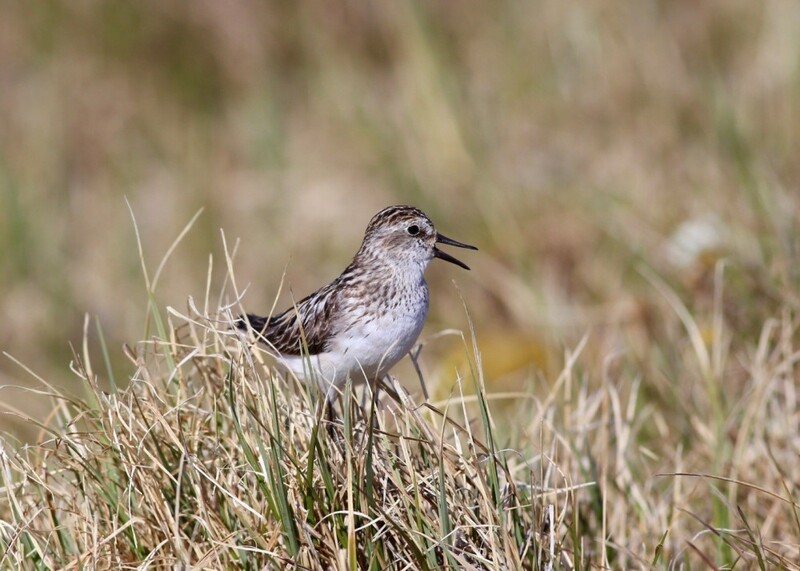 Semipalmated Sandpipers are by far the most abundant nesting shorebird, but we also have nests for Dunlin, Red Phalarope, Red-necked Phalarope, American Golden-plover, Black-bellied Plover, Ruddy Turnstone, and Semipalmated Plover. 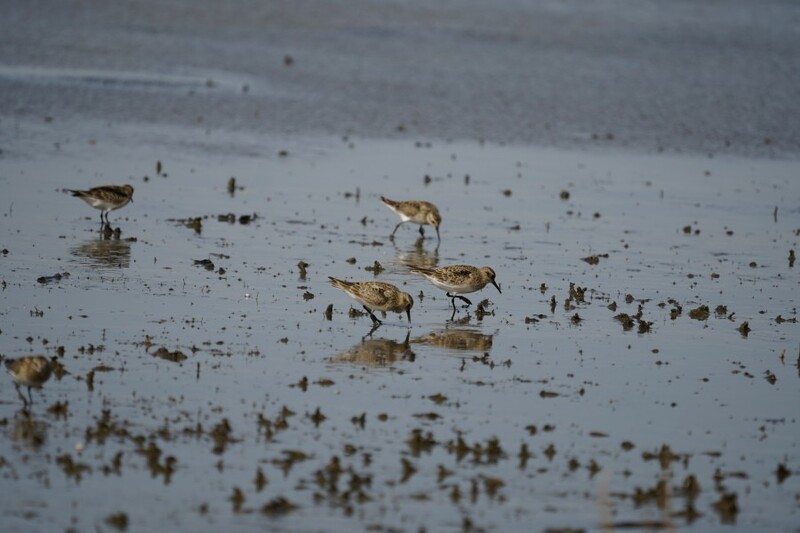 A few White-rumped Sandpipers are also around, but we haven’t seen any nests so far. 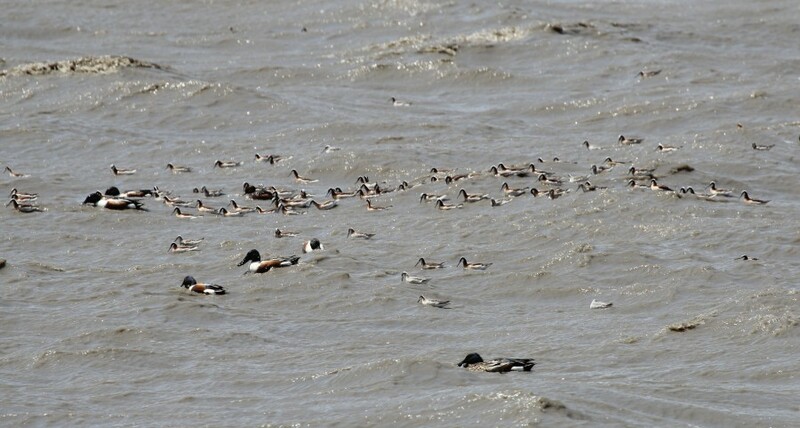 While searching for shorebird nests, we also find nests for Pacific and Red-throated Loons, King Eider, Long-tailed Ducks, Northern Pintail, Parasitic Jaegers, and Arctic Terns. A Dunlin stares back at me from her nest on a small mound. 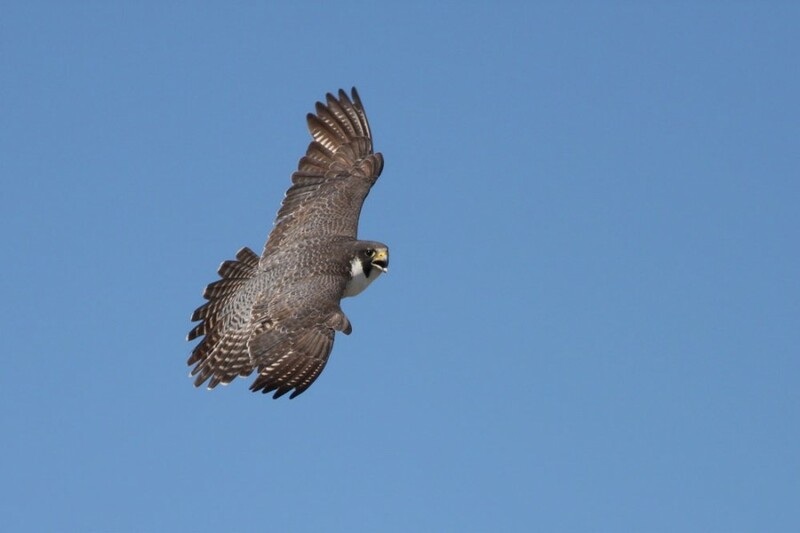 Peregrine Falcons are the primary predator for adult shorebirds on the island, though we have observed Parasitic Jaegers successfully hunting shorebirds as well. 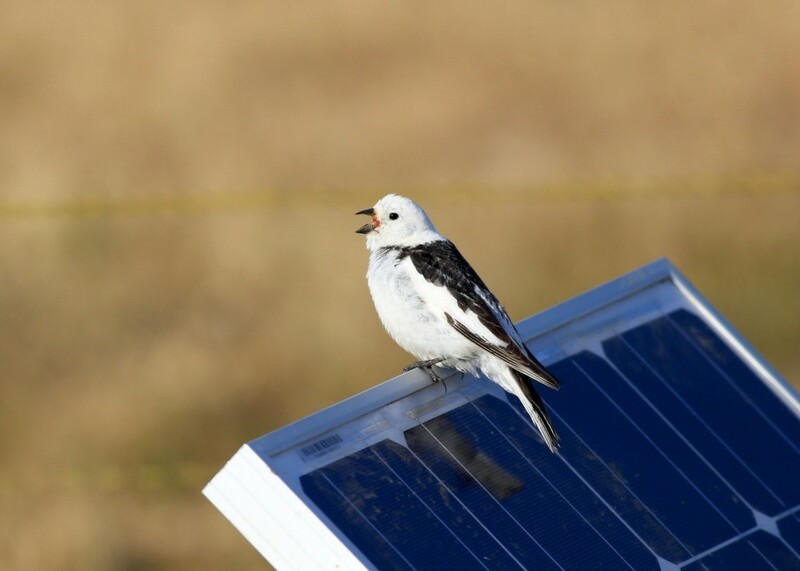 Snow Buntings nest along the coast and in the rocky uplands. 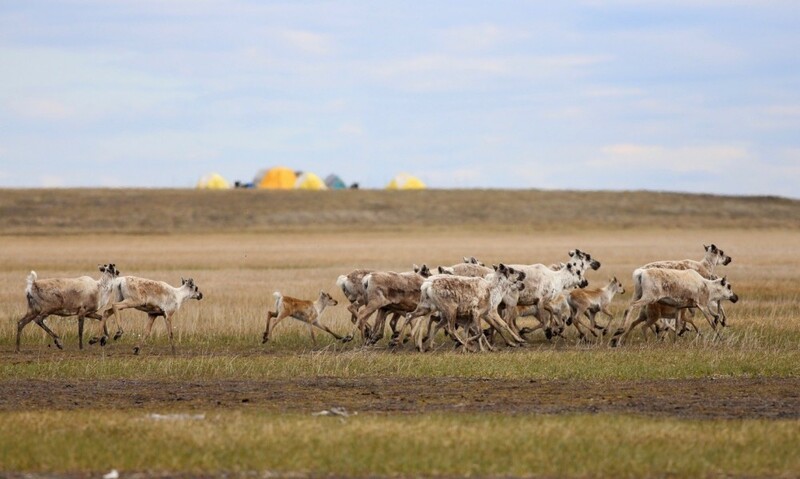 They are a rare visitor to our camp in the low wet tundra. I continue to search for and capture tagged Semipalmated Sandpipers. So far I have found 10 tagged birds and managed to recover the geolocators from all of them. This represents a substantial improvement over the 2014 season when only two of our tagged birds returned. 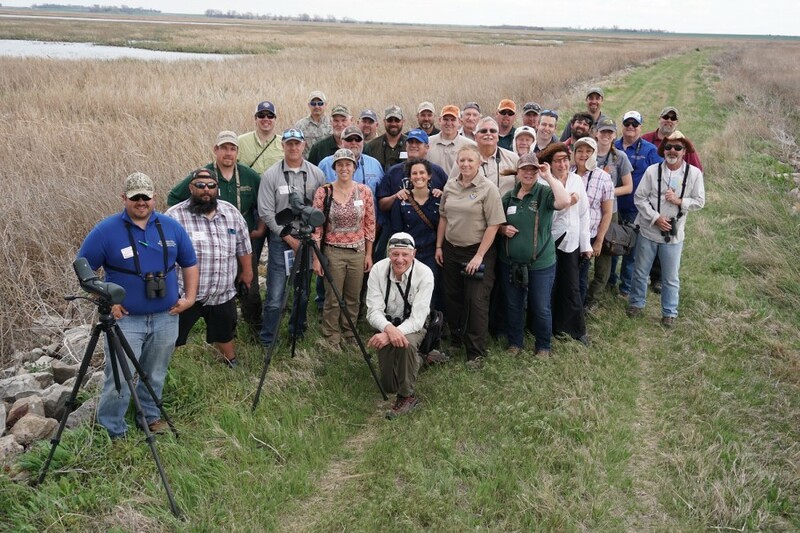 We are not sure if 2014 was a particularly bad year, or if site fidelity (the tendency for a bird to return to the same place) was different between years. We are searching a large study area, but if the tagged birds returned to nest in a different part of the island, we would be unlikely to find them. In addition to intensively searching the study plots, I am also looking well outside of the usual study area, but so far have not seen any tagged birds away from their capture sites. 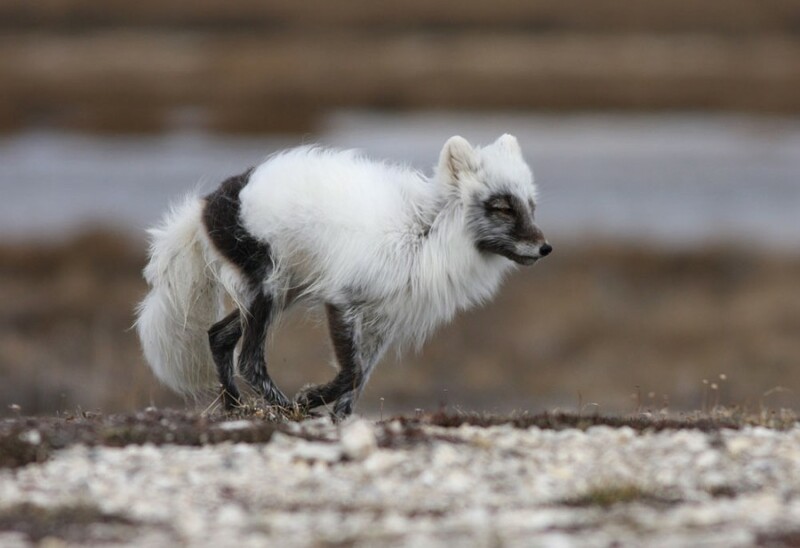 An Arctic Fox lopes along a gravel ridge in search of waterfowl and shorebird nests. With the delayed start to nesting this year, I was only able to capture two birds on the nest (our usual trapping method). I used playback calls and bow nets, noose mats, and other techniques to capture the rest. 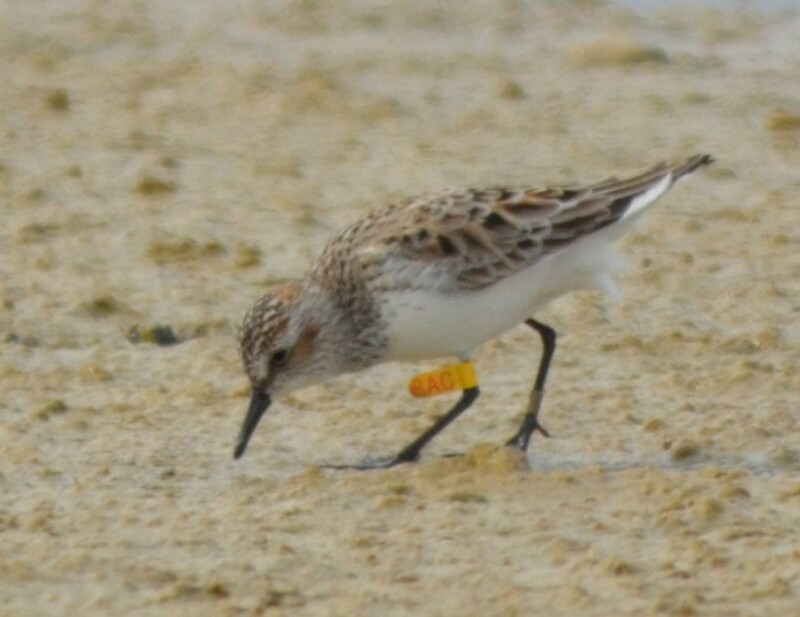 The migration tracks recovered from the geolocators should be invaluable in comparing Semipalmated Sandpiper migration, stopover, and wintering patterns from the Eastern Arctic to sandpipers migrating from Western Arctic nesting areas. The crew in camp is taking full advantage of the good weather lately. 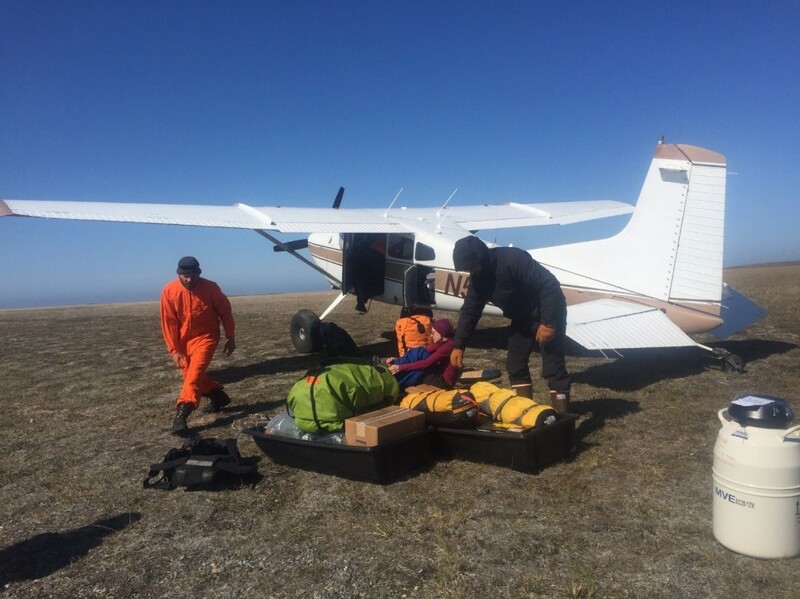 Scott Flemming is leading his third field season of research for his Ph.D. on the effects of overabundant snow geese on tundra-nesting shorebirds. 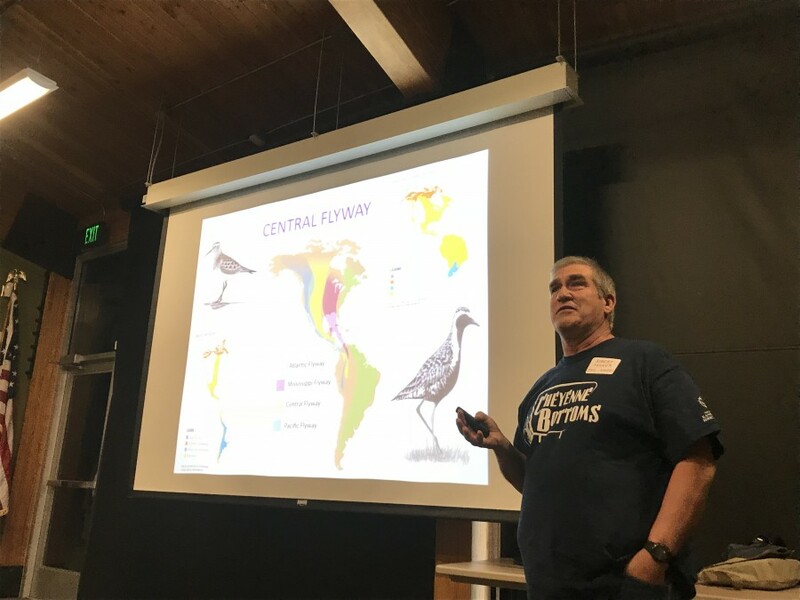 Scott is looking at differences in invertebrates (shorebird food) and vegetation between Coats Island and a companion study site on Southampton Island run by Lisa Kennedy, another Ph.D. student at Trent University. Scott and the crew are also setting out artificial nests to compare predation rates between the sites. 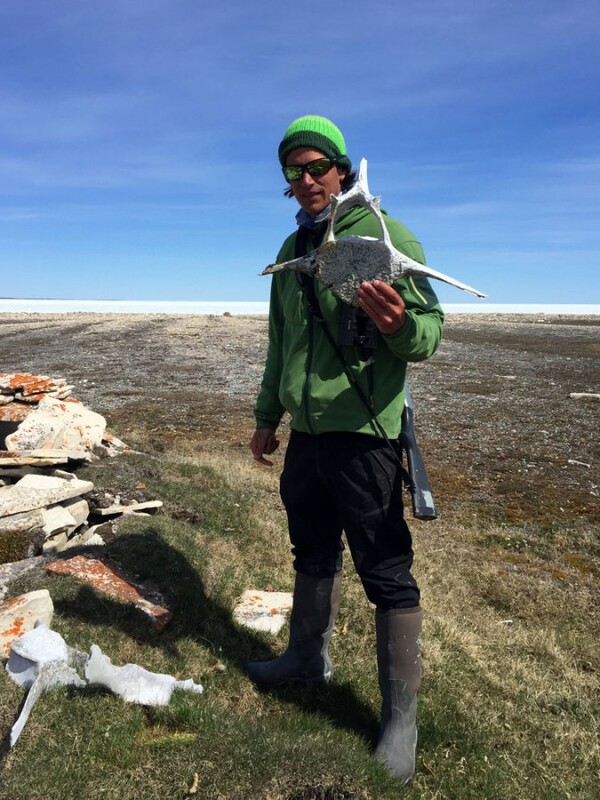 : Scott Flemming inspects a Bowhead Whale vertebrae found near the ruins of a Sadlermuit village. Dr. Erica Nol has joined us in camp for a week and is working with the crew to find nests and capture nesting shorebirds to outfit them with radio tags that can be picked up by a network of receiving towers along the Atlantic Coast. 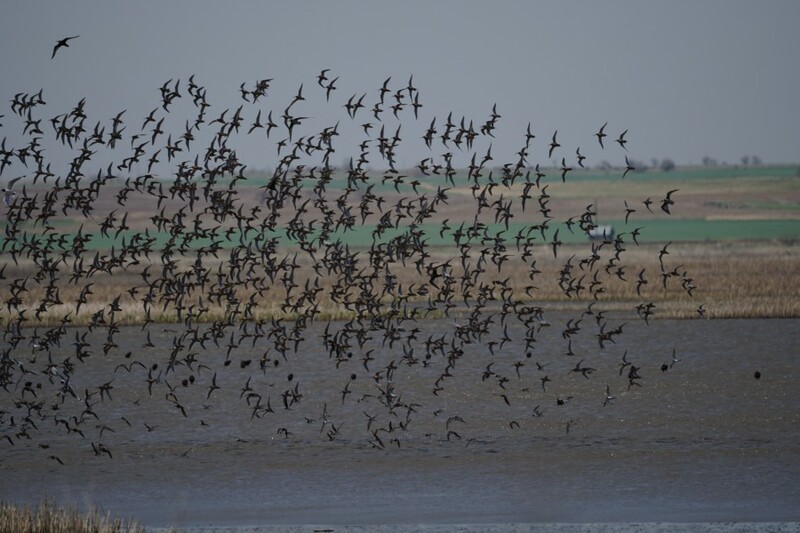 This will help us understand the timing of migration and habitat use for a broader set of shorebird species. Working with Scott are Malkolm Boothroyd, Shawna-lee Masson, and Lindy Spirak. Malkolm and Shawna are now two-year veterans of Coats Island. 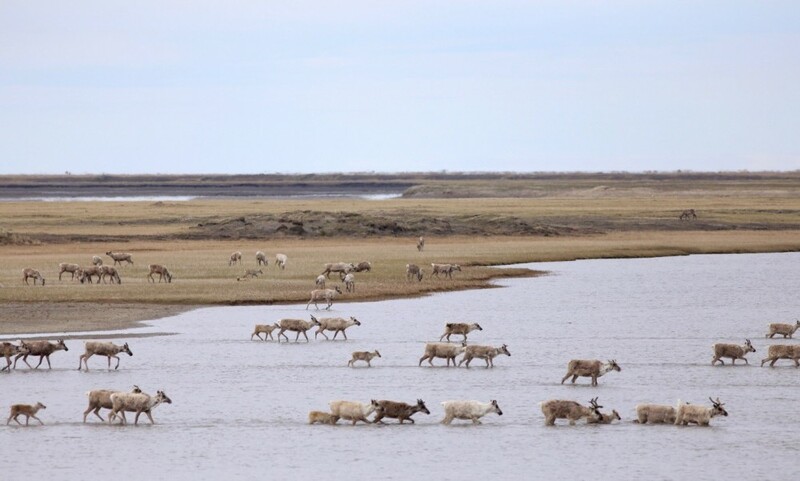 Malkolm is working on an honors project looking at Arctic Fox foraging patterns and how nest placement relative to ponds and lakes affects the probability of survival to hatching. 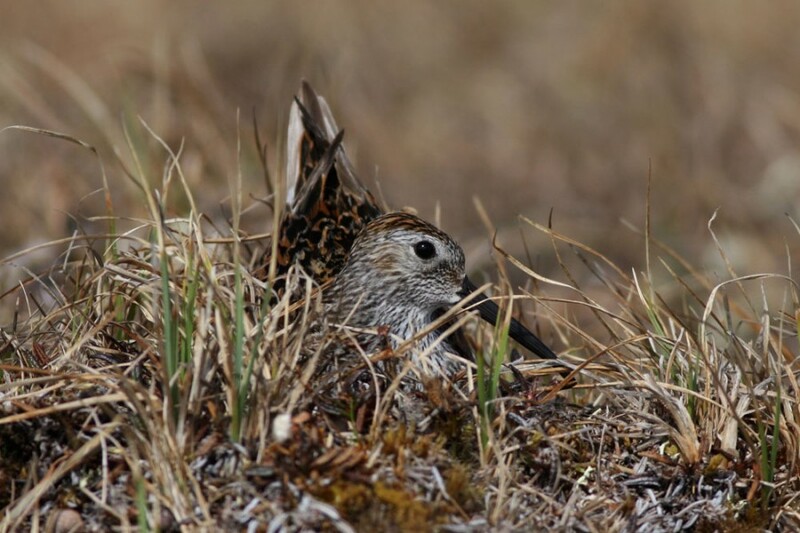 Malkolm is also our most prolific nest searcher and typically walks 20 to 30 kilometers per day mapping ponds and finding shorebird nests. Malkolm Boothroyd and Shiloh Schulte test the waters of the swimming hole on the first calm evening. 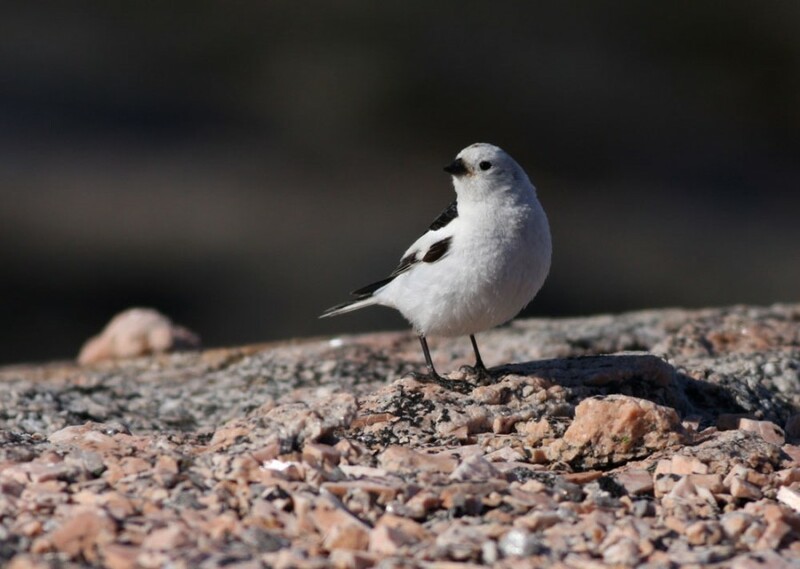 Lindy Spirak is an undergraduate student at Trent University and is conducting her honors project on the behavioral response of nesting shorebirds to the presence of Snow Geese and Parasitic Jaegers. Shawna is about to head into a masters project working with boreal songbirds, but is currently collecting more data on fox foraging patterns to supplement another project she is currently working on. 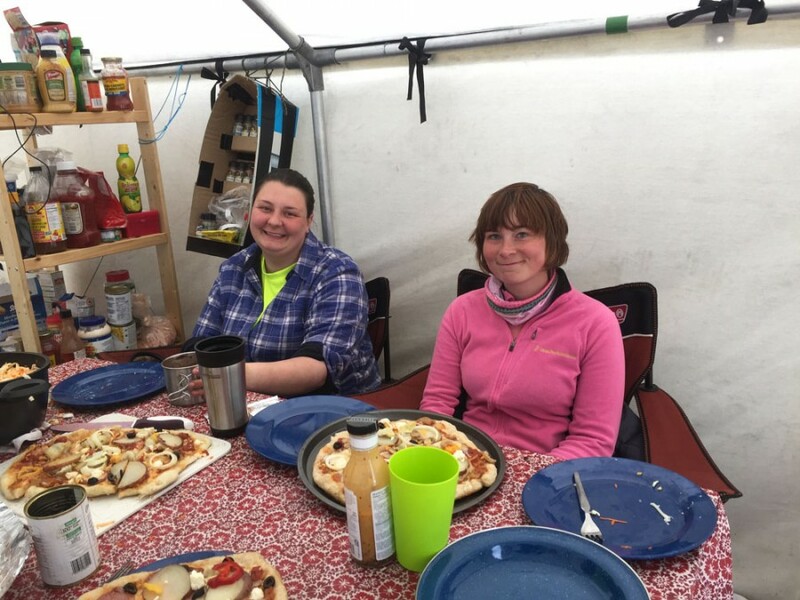 After a long day in the field, Shawna-Lee Masson and Lindy Spirak sit down to a dinner of gourmet pizza prepared by Malkolm Boothroyd. 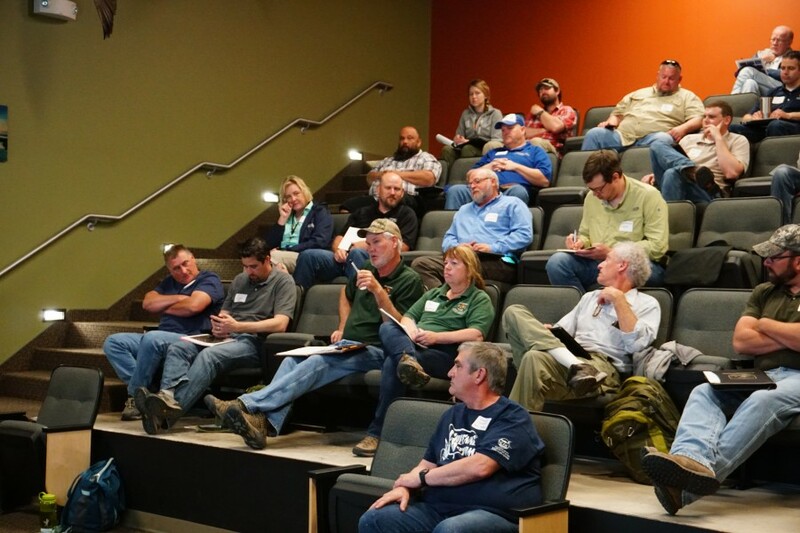 The crew is putting in long hours, both in the field and managing the flood of data, but still finds the energy to have fun and cook up great meals each night. Our work space is limitless, but our cabin is tiny, so good communication and mutual tolerance and respect are the key attributes needed. Shiloh tests out the “washing machine” that Scott made. 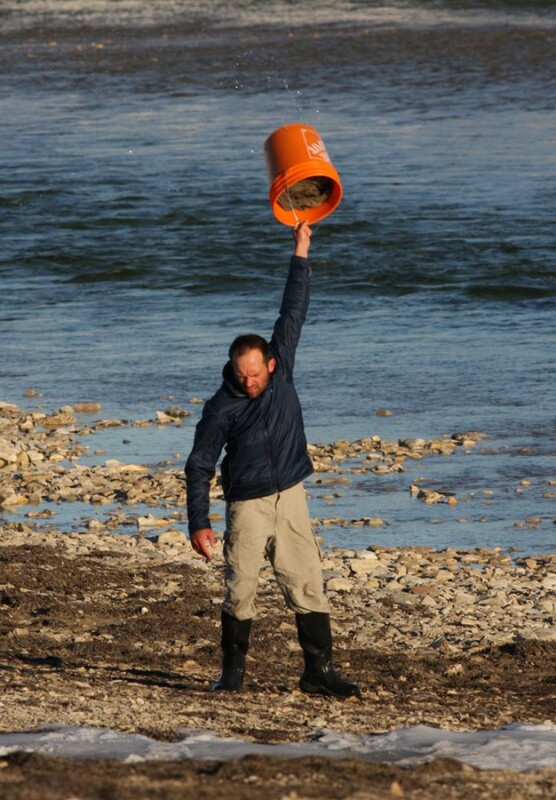 The design involves two buckets and a plunger and works remarkably well. The rinse cycle is a bit tough on the arms though. Expanding the search area for tagged sandpipers has given me the opportunity to see more of the island. Along the coast, east of our study area, the ground rises quickly and becomes rocky with high headlands and cliffs jutting out into the sea. The ice along the coast is much thinner and has disappeared entirely in some areas. 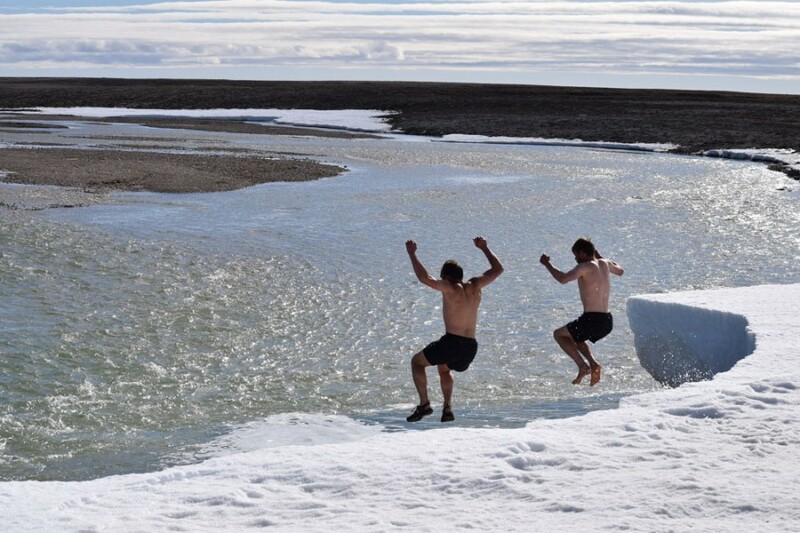 No more Polar Bears have come by our camp, but we see them on almost every visit to the coast. 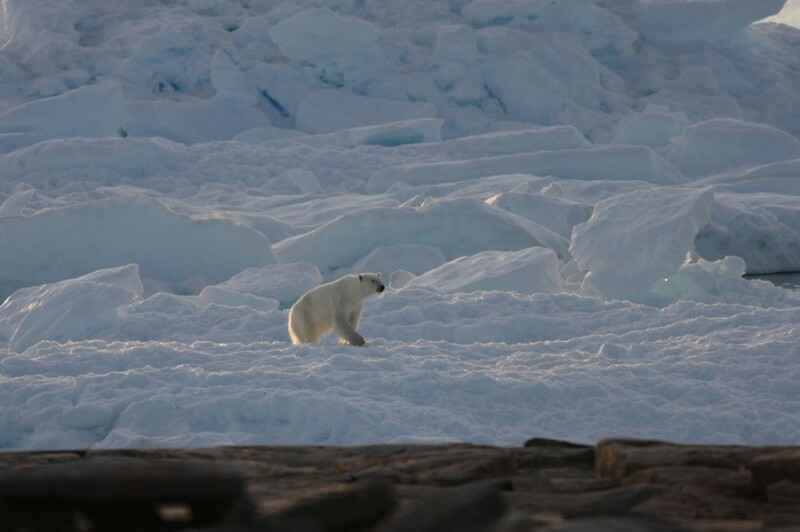 A female Polar Bear crosses an ice floe driven up against the shore. 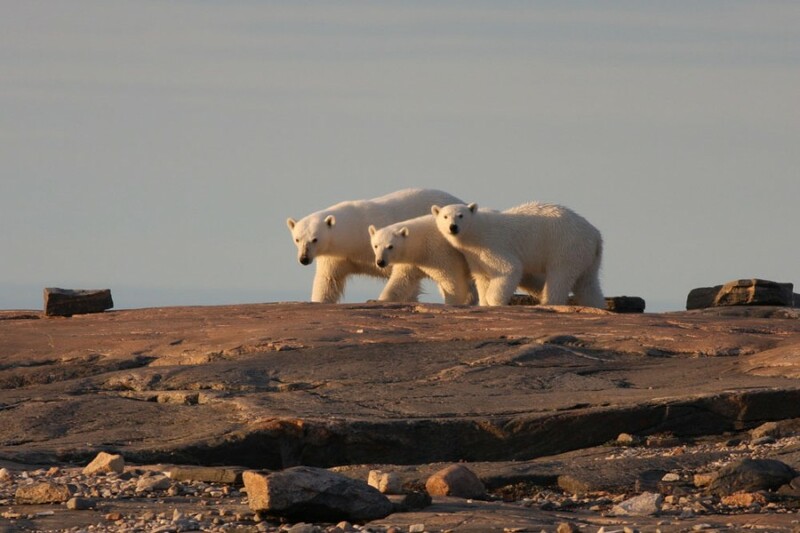 A mother Polar Bear and her yearling cubs travel the shoreline of Coats Island looking for food and safety. In addition to hunting for herself and her cubs, the mother also has to constantly avoid large male bears that could injure or kill her young. On a recent trip, I watched a mother and two yearling cubs working along the edge of the remaining ice. I was also lucky enough to see a walrus and witness a large pod of Beluga feeding in close to shore. The baby whales are grayish and swim perfectly in tandem with their mothers. I only have a few more days on the island, but my time here has been incredible. I feel very lucky for the opportunity to work in this special place with an outstanding crew. I wish them all the best as they finish out the last few weeks of the short Arctic summer. 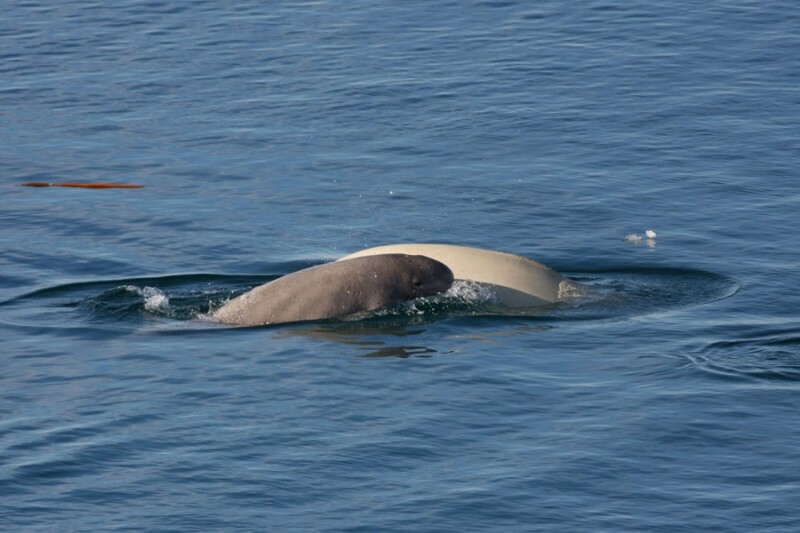 A mother Beluga whale and her baby surface while feeding along the shoreline of Coats Island.